"A top secret ingredient (salsa verde) gives this fusion sauce a different element that will have you saying, OOO-MAMI! Serve as a dipping sauce for pot stickers, egg rolls, or fried chicken. 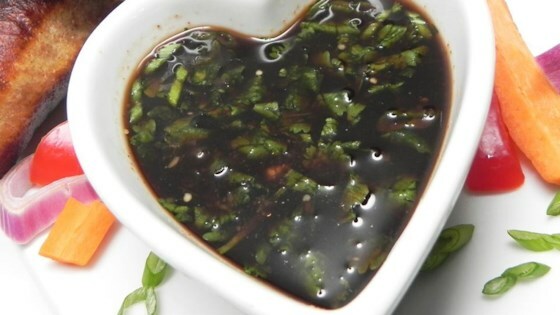 Use as a marinade for grilled meats and seafood; fantastic with chicken, pork, and shrimp." Shake soy sauce, salsa verde, sugar, lime juice, cilantro, water, sriracha, ginger, and rice vinegar together in a container with a tight-fitting lid until sugar is dissolved. Refrigerate to allow flavors to blend, about 1 hour. Store in tightly sealed container in the refrigerator for up to 2 weeks.